First and foremost, can you tell us your current position, company and describe what you do? 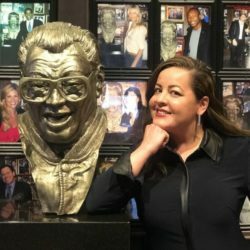 Senior Catering Manager at The Chicago Sports Museum / Harry Carays 7th Inning Stretch for the Harry Caray’s Restaurant Group. I’m part of a great sales team that book private events for both Corporate and Social Market ranging from 20-1,200. What aspects of hospitality do you incorporate in your business today? Being flexible, being as of assistance, try to make things easier for our guests planning events. Where did your hospitality career begin and when was that “aha” moment when you knew you were supposed to be in hospitality as a career? In 1996 as an Administrative Assistant to Meeting Planners. Knew right away. How many years have you been in the hospitality business? Yikes, here goes the age reveal! I started in Meeting Planning in 1996, so 20+ years. What qualities to you feel a person needs to have to be hospitality professional? Number one, hospitable, seems obvious, but not all are. Hard working most definitely. What do you love about planning events in Chicago? I love that Chicago is such a hub for convention business. Also, so competitive with something new venues, restaurants, and hotels opening daily – which pushes us in the industry to be on our game. What do you recommend for others who want to get into the hospitality profession? I have worked on both sides of the hospitality industry as both the Meeting Planner/Client and on the Hospitality side. That has helped me tremendously because you better understand the perspective and needs and capabilities of both sides. What are you passionate about? Art & Design, Mid Century Design, Food Presentation / Creativity, Career, Family that Includes my Pug Eloise. What is your favorite way to spend a Saturday? Sleep in a bit, long walk with my dog, some vintage/retro houseware & furniture thrifting, & eat out on a patio. Work often on Saturdays, so like to keep it relaxing and low key. Do you have any pet peeves? Legs showing on high boys from messy linen, when people working the floor of a restaurant have their arms crossed on the floor, leaning at the host stand…..and Contract Addendums! What was your family like growing up? Came from a wonderful Colombian family, my sister and I are first generation. What type of music do you love? All types, so I’ll say live music is my favorite. What is your favorite restaurant or bar (Personally)? Besides Harry Carays Italian Steakhouse? Versailles in LA, French name, but amazing Cuban food. So much garlic that my friends and I would make sure to bring a pack of Big Red gum for post dinner! When not working, what do you love to do? Long walks with my puppy, go to art gallery openings, check out open mic stand up, and an Arts & Crafts nerd –like DIY projects. Also love thrifting for vintage furniture especially anything Mid Century. Besides your professional talent, do you have any personal talents? (Play guitar, etc.) Had a collection of pillows & accessories I made. Have a knack for things handmade. Have you ever sung karaoke? If so, what song? Yes, Kenny Rogers The Gambler – and never again. Future trends in event planning? Interactive experiences at events will continue to grow. What does it take to be a successful even planner? Being detail oriented, organized, and being flexible and ready and able to adapt to changes and the unforeseen. Most important is great clear communication. What is your favorite color? Bright yellow! What’s your favorite thing about your hometown? Chicago’s Skyline and how much variety of architecture exists within the same city blocks. What’s the most embarrassing moment you’ve had? Recently called the Harlem Globe Trotters, The Golden Globe Trotters. I work in a sports venue too. What are your thoughts about Hereschicago.com? Hereschicago has been an incredible partner for us to have, especially being a newer venue. We continue to receive fantastic leads and referrals, and they are often BIG ones – which we love. Jim’s the best!